Did you know? Strong pedestrian guardrails are a requirement in many industrial and roadside settings. 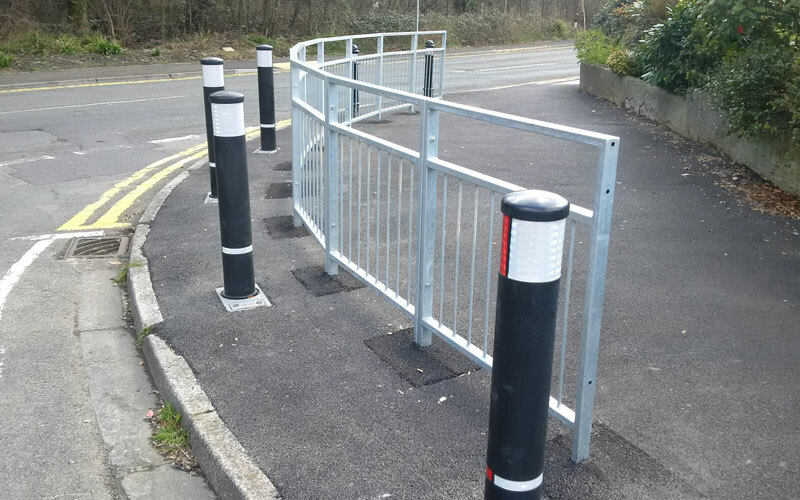 Installing robust guardrail equipment can help make your premises safer and can play a key role in areas where the visibility and safety of pedestrians is of critical importance. Pedestrian guardrails can be used on walkways, paths, bridges and in many other outdoor areas. Typically composed of strong metals, these safety structures are either concreted into the ground or bolted down, resulting in a precaution that cannot be moved by human force. When are pedestrian guardrails a requirement? Pedestrian guardrails are a common requirement where there is likely to be a high level of pedestrians, as it is in these situations that visibility of the road and its potential dangers is crucial. They are often used to stop pedestrians crossing roads at inappropriate places, or accidentally walking into areas of traffic they were unaware of. They are used at entrances and exits to buildings and at the corners of buildings, to indicate to pedestrians how much space is between them and the vehicles that may pass. It’s also important to indicate where there is an abrupt change in elevation, such as a steep drop, and guard rails are an effective warning method in these cases. It’s important to note that they do not stop the total impact should a collision occur, and depending on the location’s requirements and movement restriction bollards may be a more effective solution. If all the points addressed in this standard are adhered to in the construction and installation of the guardrails, they should have a long life and require minimal maintenance. Aside from the obvious damage that would result from a collision, the most common causes of damage include corrosion and lack of maintenance. Any damage can reduce the system’s capability to perform the intended task of protecting pedestrians. It is best to have rails that are hot dip galvanised and polyester powder coated, to ensure the highest level of protection. These finishes ensure that, if cared for regularly with a thorough wipe down with soapy water, the rails shouldn’t be susceptible to corrosion for around 20 years. However, if a collision was to occur it is likely that at least some sections of the guardrails will need to be replaced. Repairing or replacing small sections of guardrails is often not cost-effective, and many will opt to have the full guardrail replaced instead. At Ezi Klamp we stock two standard panel models in 1m or 2m lengths, meaning that small sections of your guardrail system can be replaced if required. Our Pedestrian Guardrail System is designed to enable quick construction of pedestrian control using preformed vertical infill panels. The system has been designed to fully comply with the BS7818:1995 quality standards and are supplied in a highly durable galvanised finish to BS1461:1999. We can tailor the system to the particular needs of the environment in question, with the option of raked or curved sections and base-plates for floor fixing. Panels can be easily customised with a polyester powder-coated finish to any standard RAL colour, so you can ensure visibility levels are high and that all the necessary measures are in place to protect pedestrians in your environment. Time to replace your Pedestrian Guardrails? Get in touch with us today on 0117 970 2420. For more information on panel sizes, view our Pedestrian Handrail spec sheet.